Kerala has been in the tourism maps of the world for its exotic locations, classy climate and tasty food. Talking of the tasty food, it has been often left out what lends the food this spicy, aromatic quality that is preferred by the people world over. It is the spices that are grown in the plantations of Kerala, which make the Kerala traditional dishes find a prominent place in the menus of many international restaurant chains. Experiences in Kerala are unique. Soothing and rejuvenating sights, music of bird calls and whistle of winds; all perfumed by a wide variety of spices makes up your holidaying in this God's Own Country memorable and a treasured one. The spices lend Kerala that authentic taste, which no other ingredient from anywhere in the world can match up to. Kerala spices are not limited to a few, but offer too many choices for the expert chefs and cooks to pick from. Pepper, cardamom, clove, cinnamon, ginger, turmeric, tamarind, nutmeg and curry leaves are some of the spices of Kerala. Apart from the natural edible spices that are used in kitchens around the world, Kerala offers a variety of other spices that can tickle your taste buds and twitch your noses. Some of the spices cultivated in the spice plantations around Kerala are vanilla, oregano, rosemary, thyme, basil, mint, bay leaf and sage. More than being just an aromatic ingredient in the dishes, spices find a use in many other places. Spices are used in medicines, preservatives, perfumes and above all in everyday cooking. They also serve as exquisite shopping products that enjoy international value. Spices also constitute a variety of aromatic substances used for flavoring food. The story of Kerala’s spices dates to thousands of years into the past. In the ancient world, it had total monopoly over spice trade. Kerala's claim to fame in those days was due to this monopoly. The ancient port of Muziris was the centre of the world trade many years ago - the spice trade being central to its legendary fame. It can be said that the Western colonisation itself is result of the race to control the spice trade from Kerala. Vasco Da Gama's arrival was just the culmination of the western world's rush to find the sea route to India and its spices. 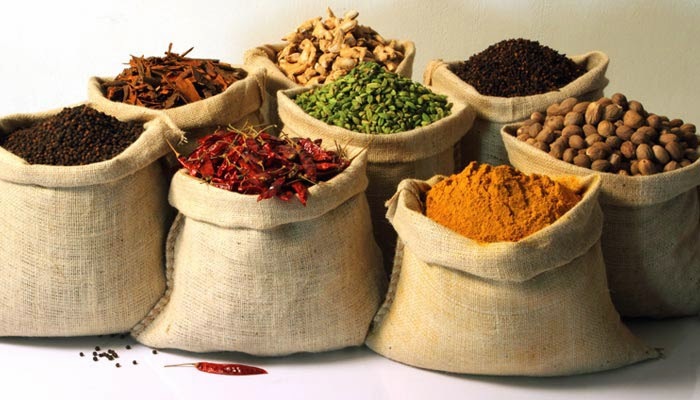 Kerala spices have carved a niche of its own in the global spice market with its rich flavour. Spices produced in the state hold much popularity throughout the world because of their variety and quality. This quality has to be owed to the climate and soil of Kerala. Moreover, they also have medicinal value and find their use in the preparation of certain indigenous medicines. High range areas like Idukki and Wayanad are the main centres of spice cultivation. Most spice plantations in Kerala have mixed tourism with it, arranging for farm stays there. This gives the travellers an opportunity to closely watch and understand how the spices are grown and what lends it the premier quality that makes it an all-time favourite in the global market. The processing of the spices is a very important step that keeps the quality of the produce intact. These farms also give an opportunity to the visitors to get a first-hand experience on the cultivation and the processing of the spices along with the skilled workmen employed there. So come down to Kerala, enjoy the beauty, eat the spicy food, rejuvenate yourself with an ayurvedic massage and take home some spices. No other place in the world will be so courteous to lend you its aroma. This is Kerala. Experience. Enjoy. Celebrate. This article is authored by Syamnath JG who is one of the authors of the blog Kerala Ayurveda.